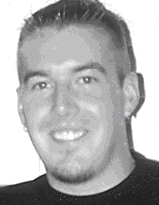 Zachariah W. “Zach” Kocses, 23, passed away Friday, December 9, 2005 due to an automobile accident in Fort Worth, Texas, where he was training for his new career with EFW, Inc. He was a graduate of Naples High School class of 2000, and was an Eagle Scout with Troop 165 in Naples. 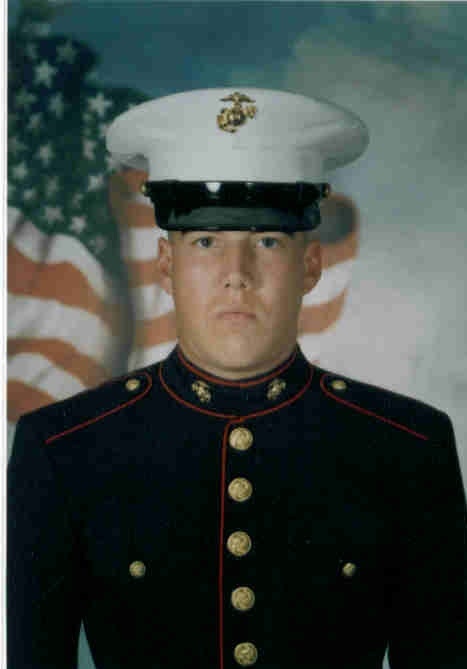 After graduation, Zach began serving his country in the Marine Corps, including service in Afghanistan during Operation Enduring Freedom, and had attained the rank of Sergeant. In 2003, he was recognized as Marine of the Year by Marine Air Control Squadron 23. This honor afforded him the opportunity to meet with the Sergeant Major of the Marine Corps. He earned two Navy & Marine Corps Achievement Medals, a Meritorious Unit Citation, a Good Conduct Medal and a National Defense Medal. For serving in the global war on terrorism he received the Global War on Terrorism Expeditionary Medal, the Global War on Terrorism Service Medal and a Sea Service Deployment Ribbon. Zach’s Grandpa Bill, Grandma Sheila and Grandpa Paul were all Marines and his beloved Papa was in the Coast Guard. He was a year away from achieving a Bachelors degree in business and was living in Centennial, Colorado, at the time of his death. Zach had an incredible spirit and zest for life. He did everything with purpose, never gave up and did things his own way. To know Zach was to know strength and a warm hug. Left to cherish memories of Zach are his fiancé and soul mate, Elyse Ricciardi of Centennial, Colorado; his parents Christine & Steve Wenner and William & Karen Kocses; his brother Jacob, all of Naples; his grandparents Jim & Marge Decker of Frostproof, Bill Kocses, Jr. of Naples, and Paul Sullivan of Belleview; his fiancé’s parents Marc & Margene Ricciardi and her brother, Ryan, all of Centennial, Colorado; his aunts, uncles, cousins and numerous friends. His grandmothers Sheila Howard Sullivan and Cocoa Kocses preceded him in death. All are welcome to attend a memorial service celebrating his life, which will be held at North Naples United Methodist Church, 6000 Goodlette Road, Naples on Saturday, December 17, 2005 at 3:00 p.m. Hug your loved ones often; it could be one of your most cherished moments. Dear Mr. Patterson: My son Zach was a Sergeant in the Marine Corps who served in Operation Enduring Freedom in Afghanistan. He was inurned on his 23rd birthday March 30th 2006. He was killed in an auto accident in Texas while off duty on December 9, 2005. Remembrance of Zach’s 25th Birthday by Dad. 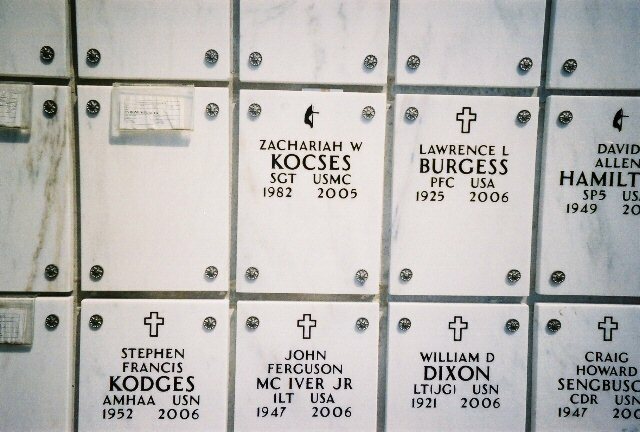 Zachariah William "Zach" Kocses, Sergeant, United States Marine Corps. March 30, 1982 to December 9, 2005. It's very hard to think of you in the past tense. I have no answers as to why we must live without you. You are in my thoughts each day. At times I feel you within my reach. Sometimes I'm just sad. It's hard to think we must all die to be together again. I am proud you had so many friends. I am proud so many loved you. I am always proud to call you an Eagle Scout. I am always proud to call you a Marine. I am proud and honored to call you son. A part of our family is gone. And yet we know someday we will be together again. I have joy in my memories. And pain when I see the future without you. I just know I love you and miss you. With all my love, Dad. Zach was a wonderful young man. He died December 9th, after putting in his time. When he came home we were all so glad, we thought he was safe and sound. He was killed in an automobile accident while he was on his way to a job that was a military connected job. He was a wonderful young man. He always had a smile on his face and a big heart. On Thanksgiving we were together and he was holding my first grandchild in his arms and he was engaged to a wonderful young girl and he said to us, he looked at the baby and the face and he looked to us and said, "Well, I guess our next baby is going to be the next baby in the family." And that was on Thanksgiving and on December 9th he left this world. So its such a sad thing. Life takes so many different paths and so many different ways. We never know. But during the time that he was in the service, the whole time our hearts were in our throat because we were so concerned about him.